In honor of National Hispanic Heritage Month, we’re spotlighting Stratus Building Solution’s very own Karla Ramirez and her mother, Carmen. That said, this duo deserves a spotlight every month. They have quite an inspiring story! Before Karla Ramirez, 34, and her mother, Carmen Malagon, 51, went into business together, they dreamed of a better life. Karla was born and raised in Mexico City, but when she was in the second grade, her life veered into another direction: her parents, Carmen and Eduardo, separated. Suddenly, she and her younger brother, Eduardo, were shuttling back and forth between two households. Money was tight, and Carmen made the decision to move to the United States and look for work. That was in 1998. In 2002, she sent for her daughter. “It was not easy,” Karla says of those days. When Karla finished school, she started working alongside her mother. For years, they had two jobs – working at a cafeteria in the morning, and in the afternoon, they were employed at a fast food restaurant. As you can imagine, two part-time jobs without benefits only barely pays the bills. 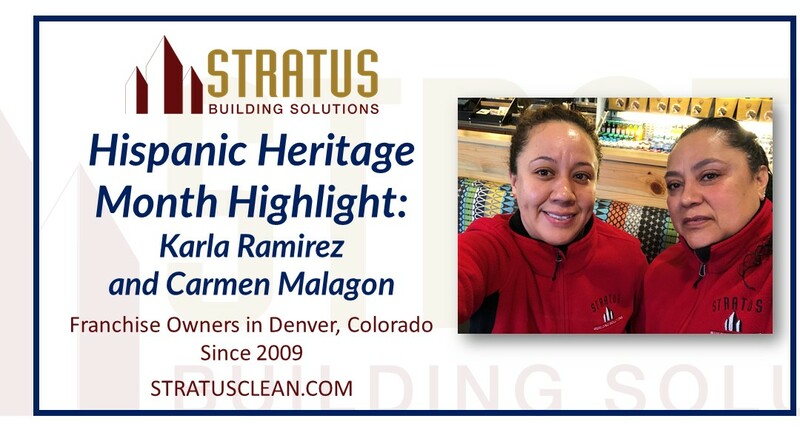 In 2009, Karla and Carmen learned about Stratus Building Solutions. They liked the business model and appreciated that the unit franchise opportunity is one of the lowest franchise buy-ins in the industry. Starting the business wasn’t easy either. There were a lot of long days and nights. Still, slowly and surely, Karla and Carmen found clients – and kept them – and started hiring employees. That was intimidating, Karla admits. “Because you not only have to think about the other people who depend on you,” she says. But today, nine years later, they have 20 employees. Mom and daughter don’t have titles – they’re just co-owners and partners. “She is in charge of the employees, and I of the clients,” Karla says. Karla couldn’t be happier being a business owner, however. She is able to send her brother and father, who both work at a store in Mexico, financial assistance when they need it, and she says she has learned a lot being a business owner. Are you interested in a brighter future like Karla and Carmen’s? Does a unit franchise opportunity with Stratus Building Solutions sound like it could be right for you? Learn more at https://www.stratusclean.com/unit-franchise.